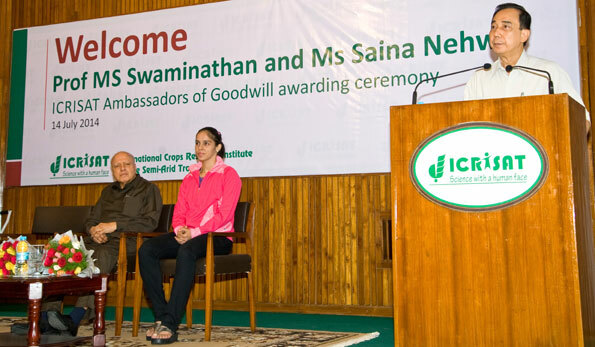 Professor MS Swaminathan, renowned agricultural scientist and Father of India’s Green Revolution, and Ms Saina Nehwal, Olympic medalist, ace badminton player and youth icon of India, have been named as the latest ICRISAT Ambassadors of Goodwill. As ICRISAT Ambassadors, Prof Swaminathan and Ms Nehwal have agreed to champion the institute’s mission to make a difference by promoting science-based agricultural solutions in the fight against poverty, hunger, malnutrition and environmental degradation in the dryland tropics of the world. “We cannot be any prouder of all our Ambassadors of Goodwill, now joined by Prof Swaminathan and Ms Nehwal,” said Dr William Dar, ICRISAT Director General. Dr Dar conferred the recognition on the new Ambassadors in a momentous ceremony held on 14 July at the ICRISAT headquarters. Prof Swaminathan and Ms Nehwal now join Mr Bill Gates, Co-Chair of the Bill & Melinda Gates Foundation; Dr APJ Abdul Kalam, renowned scientist and former President of India; Rt Hon James Bolger, former Prime Minister of New Zealand; Dr Akinwumi Adesina, Minister of Agriculture and Rural Development, Nigeria; and Dr Nigel Poole, former Chair, ICRISAT Governing Board, as ICRISAT Ambassadors to help the institute realize its vision of a prosperous, food-secure and resilient dryland tropics. “Inclusive agriculture is the key to a prosperous, food secure and resilient dryland tropics,” said Prof Swaminathan. “By giving smallholder farmers access to technologies and connecting them to markets, they will have options for a more profitable and resilient agriculture towards achieving sustainable food, nutrition, economic and environmental security,” said Prof Swaminathan. “ICRISAT plays an important role in this through its inclusive market-oriented development strategy, particularly focusing on the need to empower resource-poor farmers in marginalized environments,” he added. Prof Swaminathan also recognized ICRISAT’s more than four decades of commitment and dedicated service to the most underprivileged sector of the world – the poor in the drylands. He highlighted the challenges and opportunities facing the Institute, such as the need for crop biofortification to combat ‘hidden hunger’ caused by micronutrient deficiencies prevailing in the developing world; and science communication to inform, educate and mobilize the public on the importance of scientific innovations in the fight against poverty and hunger. 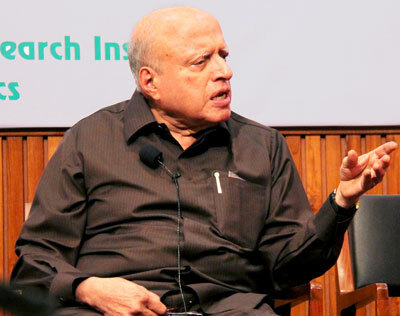 Prof. Swaminathan is currently Emeritus Chair of the MS Swaminathan Research Foundation (MSSRF), and was one of the architects of ICRISAT’s creation in 1972. The need to focus on food loss at the production, post-harvest and processing stages of the food chain. The importance of ICRISAT taking a lead role in protein revolution to help the world overcome hunger. Transforming every farm in the country into a nutri-farm. With 2015 being the International Year of Soils, ICRISAT should take the lead in activities pertaining to soil health using the Bhoochetana model. Linking the Mahatma Gandhi National Rural Employment Guarantee Act to agriculture. Making rainwater-harvesting mandatory across all states in India. 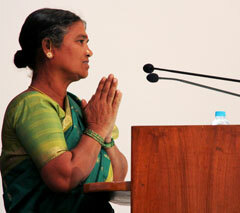 The need for farmers to apply traditional wisdom along with modern technologies in agriculture. ‘Take it to the farmer’ – scientists and research institutes should ensure that all research, technology and tools reach the farmer. 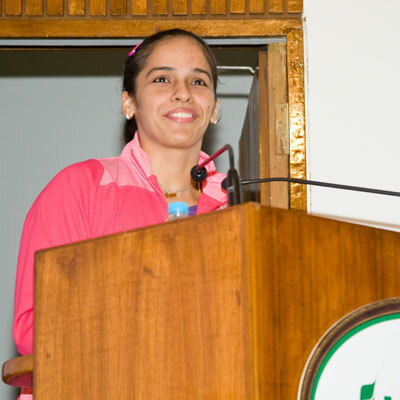 “I proudly accept the role of ICRISAT Ambassador, and hope to inspire and encourage particularly the youth in seeing the uniqueness and importance of the works and initiatives of ICRISAT,” said Ms Nehwal. Her parents Ms Usha Nehwal and Mr Harvir Singh, an agricultural scientist, accompanied her. “As an athlete, I hope I can help make people understand and appreciate the nutritional importance of ICRISAT crops such as millets and sorghum, and grain legumes such as chickpea, pigeonpea and groundnut. I strongly believe these crops are important for both poor farmers and consumers because of their high nutritional value and for a diverse diet and farming, and are critical in fighting malnutrition and food insecurity,” she continued. “Millets and sorghum, and grain legumes are good sources of endurance or energy and protein for athletes like me. Based on scientific evidence, I will lend my voice in promoting the value of dryland cereals and grain legumes for the health and well-being of the rural poor, especially women and children,” Ms Nehwal stressed. “I also work really hard for the country, like farmers, to win laurels. And I will try my best to draw attention to the critical work ICRISAT does - the needs of small holder farmers, the value of scientific research and the importance of nutritious crops that also are better for the environment,” said the 2012 London Olympics bronze medalist. “As an athlete, I can surely enlighten people on the importance of a nutritious diet and also the importance of not wasting food,” she pointed out. ‘Smart Brkfast’, developed by the NutriPlus Knowledge (NPK) Program of ICRISAT’s Agribusiness and Innovation Platform (AIP), was launched during the ceremony by Dr Dar, Prof Swaminathan and Ms Nehwal. It is a single serve ready-to-eat breakfast cereal made from sorghum and pearl millet flakes. The product is a healthy breakfast option for the entire family. It is all natural, gluten-free, and source of prebiotic. Besides being gluten free, both sorghum and pearl millet are rich in dietary fibre especially resistant starch, antioxidants, vitamins and nutrients such as iron, zinc, calcium and phosphorus. These cereals are also diabetic friendly. In addition to introducing better, healthier and safer food for consumers, such sorghum- and millet-based products are creating new markets for these crops. Ms Nehwal and her parents with Dr Dar and senior ICRISAT staff at the SatVenture. ICRISAT’s Agribusiness and Innovation Platform (AIP) is supporting entrepreneurs to scale-up and commercialize such product concepts. ICRISAT’s Smart Foods campaign aims to popularize the uptake of nutri-cereals such as millets and sorghum, which are good for the people and good for the planet. Following the event, Dr Dar, and the new ICRISAT Ambassadors of Goodwill interacted with around 70 journalists representing various media organizations. 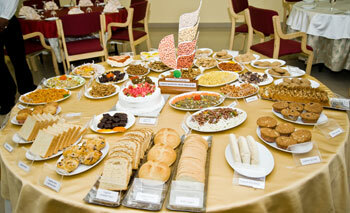 Dishes made out of ICRISAT’s mandate crops were served to the guests and packaged samples were presented to them. Sorghum is proving its resilience in withstanding extreme temperatures in summer. ICRISAT’s experiments during 2013-2014 identified some promising sorghum lines (B-lines, R-lines and varieties) which flowered normally and showed 100% seed set under temperatures exceeding 400C. The material identified will help ICRISAT develop varieties to help smallholder farmers fight climate change. Dr Stefania Grando, Director, Research Program on Dryland Cereals, ICRISAT, recently examined the materials along with Dr Ashok Kumar and other staff. Sorghum is grown on 2 million ha in summer across India and it is recommended to undertake seed production of post-rainy sorghum cultivars in early summer to reduce the lag between the seed production and marketing. A greater understanding of heat tolerance is critical in assessing yield losses due to climate variability and change. This work is undertaken as part of the CGIAR Research Program on Dryland Cereals. As part of the CGIAR Research Program on Grain Legumes, ICRISAT and its partners showcased the integrated and collaborative efforts among the participating CGIAR centers and its regional and national partners in achieving the research outputs. Dr Pooran Gaur, Assistant Research Program Director, Grain Legumes, ICRISAT presented work on machine-harvestable lentil varieties that will reduce drudgery of women, reduce labor requirement and thus increase profitability of the smallholder farmer. Dr Damaris Achieng Odeny, Scientist Biotechnology, ICRISAT-Nairobi, highlighted the specific situation in east and southern Africa and the importance of addressing the specific needs of the region. He pointed out that east Africa had unexploited germplasm and novel alleles from landraces which could be useful in the fight against poverty and hunger. ICRISAT scientists presented new opportunities for extra-early maturing chickpea and lentil varieties such as introduction in rice fallows and new niches such as spring planted crop. They also discussed lessons learnt from east and southern Africa in managing aflatoxin contamination in groundnuts. Dr Esther Njuguna-Mungai, Scientist - Gender Research, ICRISAT, presented the status of gender research in CRP Grain Legumes. She informed that the Gender and Agriculture Network has designed a global study on gender norms, agency and innovations in agriculture and natural resources management. 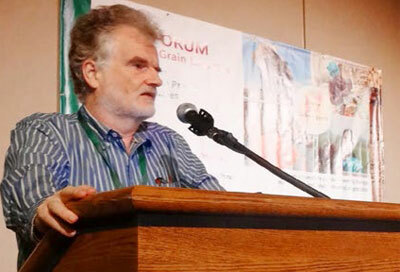 The Open Forum meeting on Science in Grain Legumes held on 6 July in Saskatoon, Canada was held to highlight the high-quality science research conducted within the program to improve legumes research that will ensure food and nutrition security in dryland areas. The CGIAR Research Program on Grain Legumes is led by ICRISAT with the International Centre for Agricultural Research in the Dry Areas (ICARDA), the International Center for Tropical Agriculture (CIAT) and the International Institute of Tropical Agriculture (IITA) as partner agencies. The demand for finger millet in Kenya is on the increase and women are benefiting from this trend. “Ever since the scientists introduced us to the new varieties and showed us how to take good care of the crop, we have seen a big difference in production. In the past, we could harvest only 2-3 bags but now we harvest up to 10 bags per acre,” said Ms Jennifer Amwait Omuse, a farmer in Busia County, Western Kenya. Before the implementation of finger millet improvement activities under the Harnessing Opportunities for Productivity Enhancement (HOPE) of Sorghum and Millets in Sub-Saharan Africa and South Asia Project, the consumption and marketing of finger millet was on the decline especially due to low productivity of local varieties and lack of improved management options. This is however changing as more and more farmers are adopting the improved high-yielding varieties and better crop management practices promoted by ICRISAT and partners in the region. “In the past we would use the broadcasting method which made it very difficult to weed, but now we have been shown how to plant in rows and use small amounts of fertilizer. The new varieties and the better crop care have led to much higher harvests. We now plant twice a year as the new varieties take only three months to mature. We have enough food. 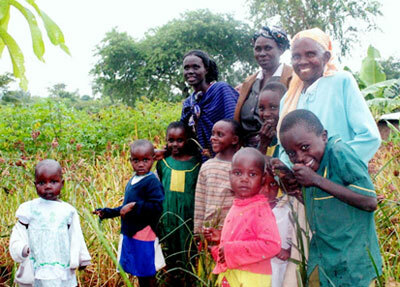 Our children are in good health thanks to the nutritious foods made from finger millet,” she added. Ms Omuse is one of the several farmers who showcased their finger millet farms during a field day organized by ICRISAT on 10 July in Teso South, Busia County in Western Kenya. The field day brought together 50 farmers from the area and seven farmer representatives from the Rift Valley in Kenya, under a farmer exchange visit program. These successes and farmer feedback were highlighted during the field day where Drs Eric Manyasa, Sam Njoroge, Patrick Audi and Daniel Otwani from ICRISAT, Dr Paul Kimurto and Mr Bernard Towett from Egerton University and other project partners interacted with the farmers. Finger millet is high in calcium, zinc and iron. This makes it a highly nutritious traditional cereal – particularly important for infants, children, expectant and nursing mothers and the sick. Its small seed size deters storage insect pests, and its grains can be stored for over 10 years without damage or loss. Local women feed their children with uji, mandazi, chapati, and cakes made out of finger millet for breakfast. The food is also sold in the market enabling farmers to earn some extra income. “The income from selling surplus finger millet grain and food products has helped us pay school fees for our children, build houses and pay medical bills of our families,” Ms Omuse adds. Ms Margaret Ibere Osuru, Chairperson of the Njugu women’s group also showcased her finger millet farm. “I have been using the new varieties and new farming methods for three years now. I was unable to provide education for my first two kids. 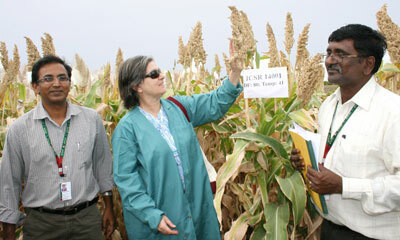 But times have changed since I started finger millet farming using improved varieties U15 and P224,” Ms Margaret said. The HOPE project is supported by the Bill & Melinda Gates Foundation. The activity was undertaken as part of the CGIAR research program on Dryland Cereals. At Seed Tech Asia 2014 conference organized by ICRISAT’s Agribusiness and Innovation Platform (AIP) stakeholders focused on how technological interventions and proper management at the post-harvest stage can help reduce losses and thus improve yields for the smallholder farmers. 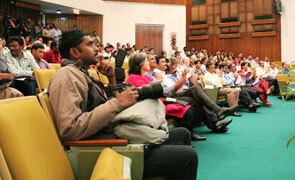 As part of the conference, an Indo-Israel session on ‘Post-Harvest and Food Security’ was organized. This was followed by a panel discussion on ‘Technologies on Post-Harvest Handling of Crop Produce - Way towards self-sufficiency’. The sessions focused on how to improve the post-harvest scenario for the Indian smallholder farmer drawing on experiences from Israel. Dr Saikat Datta Mazumdar, COO, NPK-AIP, ICRISAT, presented a case study discussion on ‘Food Technology and Food Processing’. Mr Aravazhi Selvaraj, COO, INP-AIP, ICRISAT, presented on ‘Post-harvest Scenario and Need for its Management’. During the conference, ICRISAT team interacted with Mr Pocharam Srinivas Reddy, Agriculture Minister of the newly formed state of Telangana, India. 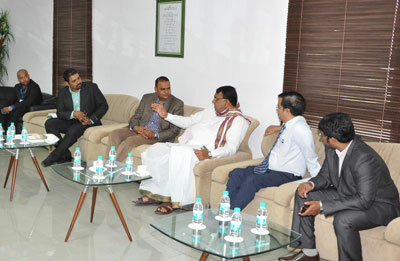 The minister discussed with ICRISAT the agricultural and horticultural development plans for Telangana. The Seed Tech Asia 2014 conference held on 8-9 July 2014, was hosted as part of AGRITEX 2014, an agricultural trade fair, bringing together the farming community, agri-specialists and agri-service providers under one roof. This is the biggest platform for promoting start-ups and agripreneurs in India. six women legislators from the Philippine House of Representatives together with their staff and representatives from the Country’s Department of Agriculture and the Philippine embassy, Delhi, visited ICRISAT-India from 5-9 July. Members of the delegation included Hon Evelina Escudero, 1st District Sorsogon; Hon Estrellita Sunasing, 1st District Nueva Ecija; Hon Angelina Tan, 4th District Quezon; Hon Magnolia Rosa Antonino-Nadres, 4th District Nueva Ecija; Hon Maria Vida Bravo, 1st District Masbate; Ms Marielle Milagrosa Galarosa; Executive Asst of Hon Evelina Escudero of Sorsogon; Ms Andrea Marie Escudero, Research Assistant of Hon Evelina Escudero of Sorsogon; Ms Dolores Ricafranca, Center Chief of DA-RFU ROS Sorsogon; and Ms Maria Agnes Cervantes, Staff of the Philippine Embassy, Delhi.